The San Joaquin River Restoration Program is the direct result of the San Joaquin River Restoration Settlement reached in September 2006 by the U.S. Departments of the Interior and Commerce, the Natural Resources Defense Council (NRDC), and the Friant Water Users Authority (FWUA). The Settlement, which followed an 18-year lawsuit, received Federal court approval in October 2006. Federal legislation, the San Joaquin River Restoration Settlement Act, was passed in March 2009 authorizing Federal agencies to implement the Settlement. 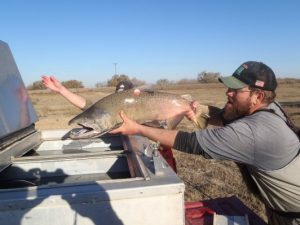 Restoration: To restore and maintain fish populations in “good condition” in the main stem of the San Joaquin River below Friant Dam to the confluence of the Merced River, including naturally reproducing and self-sustaining populations of salmon and other fish. Water Management: To reduce or avoid adverse water supply impacts to all of the Friant Division long-term contractors that may result from the Interim Flows and Restoration Flows provided for in the Settlement. Planning and environmental studies are currently being completed under the authority and funding of the Central Valley Project Improvement Act (CVPIA). Signed in 1992, the CVPIA included provisions for developing a restoration plan for the San Joaquin River and instituted a fee structure for Friant Division contractors for such activities. With the passage of Public Law 111-11 in March 2009, the Settlement establishes the San Joaquin River Restoration Fund (Fund). Approximately $17 million per year of payments from the Central Valley Project Friant Division would be deposited into the Fund to be available without further appropriations to implement the provisions of the Settlement. Funding by the State of California will also support the Settlement. In November 2006, State propositions 84 and 13 were passed by the California voters and should provide about $200 million of State bond funds for projects that will directly contribute to the restoration efforts. Have more questions about the SJRRP? Check out our Final FAQ Fact Sheet 12-10-07 (45 KiB) for answers to frequently asked questions, or contact us for more information.